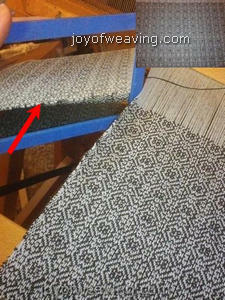 If you're weaving something with a busy pattern or where the warp and weft are the same colors, it may be difficult to immediately spot errors. One way to check for errors is to lean over and view the web from the side, or if you have mobility issues, a mirror is helpful for viewing the web from the side. Mistakes will stick out like a sore thumb. A mirror is also helpful for checking the underside of the web during weaving. Another way of spotting errors is to take photographs from different distances and angles. You'll likely notice inconsistencies when you view them.